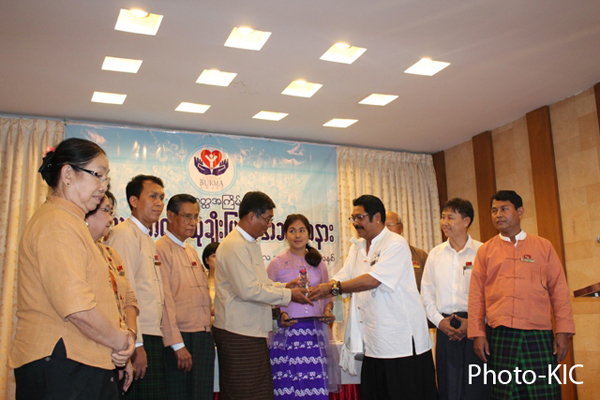 The National League for Democracy’s Education Network, is the winner of the Myanmar Citizen Award for 2013, it was announced on June 10. The Myanmar Citizen Award is awarded annually by the Citizen Award Committee formed by Overseas Myanmar Families to honor people and groups who have worked for civil society and in the interest of the people. This is the first year, since it was started in 2010 that the award presenting ceremony was held inside the country. Speaking at the award presenting ceremony, Citizen Award Committee Chairman, U Wai Hla Win said. Dr. Thein Lwin, a member of the NLD-education network, spoke at the ceremony and said his group has worked on running free trainings for the children who are not able to go to school and had provided vocational skills training for communities. In addition to the annual Citizen Award, for 2013, a special Citizen Award was given to Ko Ye Lwin, a singer and composer, who helped raising fund for refugees in Rakhine and Kachin areas, Ko Than Naing, who contributed inexpensive and simple technics to rural areas to get clean water and Captain U Nay Myo Zin, who advocated for getting back confiscated land. The previous Citizen Award winners were U Kyaw Thu from the Free Funeral Service Society in 2010, in 2011 it was given to Daw Shu who made weekly donations to the monk prisoners and in 2012 awarded to Laphine Naw Main for is working on civil welfare in Kachin area.